This is one of my favorite coffee mugs. You see, Plan A is usually my plan. It’s my great idea, my brilliant scene, my timing, my To Do list, my my my. 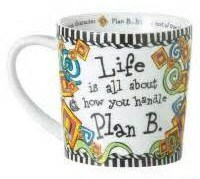 Plan B is God’s plan. However, as I continue to fall more in love with Jesus, as I consciously and purposefully choose to trust His love and His way and His word, I come to Plan B much sooner. My plan may be Awesome, but His is Better. Even Best. Okay, His plan is Bester. Always. He always has the better ideas (mine seem to work out...okay...). He always has everything under control (I very rarely have anything under control). He always works everything out for my good (I wish I could do that). He always does all of these things in perfect timing (I’m usually way too early.). It’s amazing how much less stressful my life is when I go with God’s plan. You see, if it’s HIS plan, it’s up to HIM to make it happen. Now, I do my part for sure, but the details, the success, the blessing, the protection, the timing, the whatever, are totally up to Him. Knowing all of this makes it easier to go with Plan B from the start. Care to join me? I’ll bring coffee, but you’ll have to bring your own mug.